87 percent of individuals afflicted with eating disorders are children and young adults under the age of 20. As most of these young people reside at home, side by side with family members and loved ones, the onset, diagnosis, treatment and recovery of eating disorders become a shared experience … played out at kitchen tables, in family bathrooms, restaurants, and health clubs. The effective involvement of family members in the individual patient's recovery from an eating disorder can only enhance the speed, efficacy and sustainability of the healing process. 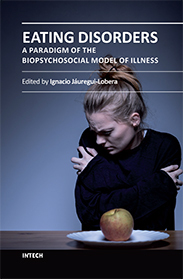 · Though these disorders strike individuals, with eating disorders, the entire family system becomes affected; in fact, the disorder takes on the role of another family member. Parents, siblings, extended family, friends and loved ones all share the experience. 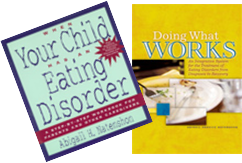 · Unprepared as they are, parents and family members invariably become the primary diagnosticians of an eating disorder. Eating disorders are secretive and lethal diseases that rarely show themselves in the medical doctor's office. In addition, their presence is typically silent in laboratory tests till the latter-most stages of disease. · Eating disorder recovery is essentially a home-based process. Patients typically spend 50 minutes a week with their therapist or doctor. For the rest, children live out their recoveries under their parents’ noses “24/7,” at school, over time, with friends, within the context of daily living; and that is as it should be. Parents, families, teachers, coaches, all need to become educated, enlightened, and supported in their efforts to support the child in recovery. · In research carried out at the Maudsley Hospital of London England, there is evidence that family treatment is more effective than individual psychotherapy for anorexics living at home who have been ill for less than 3 years. · The nature and degree of parental involvement will vary widely with the age and needs of the child, the severity of the disorder and co-occurring conditions, the skills and emotional capacities of the parents, the quality of the family therapy and attitudes of the treatment team, as well as the nature and quality of the ever-changing parent/child connection. · The family-based nature of eating disorders is also relevant to adult patients, to include both families of origin and nuclear families. No matter what our age or life stage, we all remain products of the family system in which we reside(d). Family therapy is the most effective way to treat everyone's needs. Though not disease carriers, parents and siblings become deeply affected by the presence of an eating disorder within the family system. In families where various members of the system carry symptoms of eating disorders or disordered eating, family and recovery issues become more complex. The potency of the eating disorder typically drives a wedge between family members, isolating the afflicted child from loved ones at the time of his or her greatest need; separating the other siblings from parents who tend to be hyper-focused on the eating disordered child; and at times, creating conflict and guilt between husbands and wives, particularly for those who fail to achieve a "united front" in offering their parental response. Family members need a vehicle through which to understand the complexity of the disease and recovery processes, a forum to communicate their own concerns and needs to the patient and with each other, and the opportunity to learn how best to support the child and the recovery process. They need personal support and bolstering in the face of what typically tends to be an extended, convoluted, jarring and frustrating recovery process for the entire family. Family therapy provides that vehicle. Therapists treating eating disorders must be vigilant and respectful of the power of the family system with its potential to eradicate(or possibly sustain) disease, tapping into the family system as a most powerful resource as early in treatment as is appropriate and as often as is needed. The individual child's efforts to make recovery changes are facilitated and enhanced not only by a family that understands and supports the recovery process, but by family members who are committed to making their own parallel personal and family-based changes to accommodate the needs of the changing child. In instances where a child's resistance to recovery may be extreme, changes made within the wider family system, particularly regarding parental response to the child and disorder, may be sufficient to evoke change within the afflicted family member. In instances where the patient may be resistant to, or geographically too removed from family involvement, the skilled practitioner can conduct family treatment "in absentia." The potential for the family unit to facilitate change is far greater than the sum of its parts; children heal more completely, more sustainably, and more effectively, when families are enabled to become constructively involved. Clear communication becomes enhanced, and in becoming direct, eradicates the risk for confidentially breeches and privacy rights infringements through reporting. Moreover, children who learn to function and communicate more effectively within the context of their family carry these valuable interpersonal skills into their other relationships as well, making life a healthier, happier place to be, both now and in the future. Beware of the warnings of misguided health professionals who believe that eating disorders are caused by poor parenting, or who consider parental intervention to be a form of over-controlling interference, diminishing the child’s autonomy. Such a professional might seek to exclude parents from the psychotherapy process to protect patient/therapist privacy and confidentiality rights. This thinking is indicative of a professional unaware of the uniqueness of these disorders and of the requirements of their treatment, and of the power of the family system to enhance the child's recovery. Or, such a clinician might simply be inexperienced with eating disorders as a treatment specialty, unfamiliar with family systems theory, or otherwise inexperienced or uncomfortable treating family groups. When the individual child, teen or young adult patient walks through my door, I envision the virtual “crowd” of loved ones also requiring attention. Within the context of family treatment, the eating disorder psychotherapist needs to encourage the healthy development of the relationship between parent and child… the therapist is present in the life of the child temporarily; parents remain parents forevermore. The healthfully bonded connection between parent and child holds the potential to fill in developmental milestones missing for the presence of the eating disorder. The best prognosticator of healthy separation is healthful parent-child bonding and secure attachment; healthy separation and individuation and the autonomy that comes of them evoke self-trust, self-esteem, and self-regulation… all benchmarks of recovery. It is for the child-patient's therapist to role model for parents loving limit-setting and problem-solving, inspiring and enabling them to become their child's and the treatment teams’ greatest advocates. For parents who have lost faith in their ability to parent, intimidated by a daunting disorder and the child who has newly become a stranger to them, therapist education and guidance restores their self-confidence and grounding, allowing them to fulfill their loving obligation to become "parental" once again. Parents and child both come to understand that the need for parental controls of the severely ill child is temporary, until the recovering individual becomes capable of resuming the capacity and responsibility for self-regulation. · On-going and unconditional support, day in and day out. · Nutritious meals which they prepare, and sit down to eat together with the child. · Monitoring of food intake; symptom management where appropriate, and case management where appropriate. · Involvement in family treatment to support the child and recovery process, and to resolve underlying emotional issues within the family system that may be driving the dysfunction. In summary, when it comes to the treatment and healing of eating disorders, for parents, simply loving one's child is not enough.